“Moving Michigan Forward” is a well-known slogan of Governor Snyder’s, meant to signal his drive for progress in Michigan. That has been achieved only in part when it comes to Michigan’s natural resources. 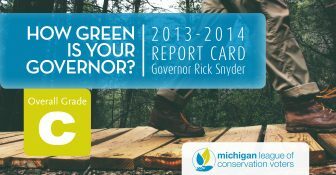 We know Governor Snyder is “one tough nerd” but when it comes to tackling important subjects, like Michigan’s natural resources, he has not been a consistent leader for protecting our environment. The governor’s final grade of “C” reflects a second two-year period full of mixed decisions — a few strong stands and some serious missteps with long-term consequences. To improve his grade in his second term, the Governor should apply himself better to protecting Michigan’s land, air and water. Review the full 2013 – 2014 report card right here. review the full 2011 – 2012 midterm report card right here.